Istanbul is located in northwestern Turkey within the Marmara Region. The Bosphorus, which connects the Sea of Marmara to the Black Sea, divides the city into a European side and an Asian, Anatolian side. The city is further divided by the Golden Horn, a natural harbor bounding the peninsula where the former Byzantium and Constantinople were founded. This body of water separates the “old” and “new” parts of European Istanbul. The word “golden” comes from an urban myth that claims there was an Ottoman group of ships filled with gold and jewelry that sank in the sea and have not yet been found. The word “horn” suits the body of water as it is shaped like a horn. Like Rome, Istanbul has also been called "The City of Seven Hills" because the oldest part of the city is supposedly built on seven hills, each of which bears a historic mosque. During its long history, Istanbul has served as the capital of the Roman Empire, Eastern Roman (Byzantine) Empire, the Latin Empire and the Ottoman Empire—all of which have added different flavors to this city, which is reflected in its architecture and heritage. The religion with the largest community of followers is Islam, however, religious minorities also include Christians and Jews. There are more than 2,200 active mosques, 123 active churches and 26 active synagogues. Istanbul is also called “The City of Minarets” for having a huge number of mosques, which carry at least four minarets each. One of the oldest and biggest mosques in Istanbul is Sultan Ahmed, also known as the Blue Mosque for the blue tiles that decorate the walls of its interior. 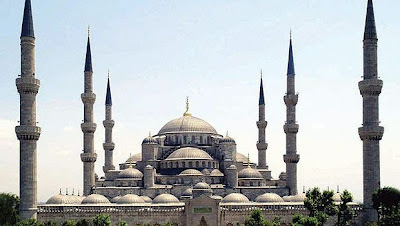 The Blue mosque, which has six minarets, was built between 1609 and 1616, and like any other mosque at that time, it was used as an Islamic school and a mosque for praying.